Gold jewelry is very attractive and durable, whether it is white, yellow, or rose gold. Most consumers buy 14 karat gold, which is more readily available in jewelry stores. The majority of pieces that are part of the stock in jewelry stores are 14 karat gold and designed to be sold to mass consumers. Gold that is 24 karats is pure gold. Compared to 22 karat gold, 14 karat gold contains more alloys. Alloys are blended with gold to allow jewelers to make jewelry that is wearable since pure gold is too soft and bendable. The most common elements or alloys that are mixed with pure gold to improve strength in the jewelry making process are nickel, copper, and silver. There might also be other metals, such as manganese, aluminum, cadmium, or palladium, depending on the manufacturing process. These also determine the color of the gold, depending on the blended amount. Taking pure gold (24k) as a measure, 22 karat gold is 22 parts pure gold and 2 parts alloy content. Fourteen karat gold is 14 parts pure gold and 10 parts alloy content. Some European countries do not include nickel as an allowable content in their gold. People who experience allergy reactions to gold jewelry are reacting to the content of nickel in the piece of jewelry. Reactions to nickel can include a rash, redness, and itching of the skin. The more alloy content in a gold piece, the stronger it will be. It will also be less bendable and less flexible. This is why most jewelry is made of 14k gold. Compare to 22k gold pieces, 14k gold pieces are stronger and take more daily wear. Jewelry that will take a lot of abuse and daily wear and tear should be bought in 14 karat gold. Twenty-two karat gold pieces, which are close to pure gold, should be reserved for special occasions or used lightly as they will bend and loose shape due to the softness of the gold, as it is so close to being pure. In the United States, 10k gold is the limit for alloy content. In the UK, it is 9k. These pieces will be the hardest and strong, well suited for daily wear and hard manual work. Gold jewelry must be stamped with the amount of gold in it, for example, 14k or 14kt - any of these markings is acceptable by jewelry standards. While 14 karat gold is more common in the United States and some Latin American countries, 22 karat gold is the preference in Arabic countries and India, as well as other Asiatic regions. Twenty-two karat gold is more expensive in price, especially in the USA due to its gold content. Fourteen karat gold is more marketable in the jewelry industry, and it seems to be a good compromise between gold content and budget. Many Mediterranean and European countries use 18k gold in their jewelry. Portugal uses 19k, and some northern Europe countries might even use 8k or 9k gold. 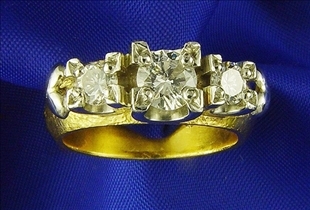 The yellow color of 22 karat gold is very rich and deep compared to the lighter yellow color of 14k gold jewelry pieces. The more gold content the deeper the yellow color in a yellow gold piece. Alloy content, flexibility, and use are important factors when selecting gold. The selection between 14 karat and 22 karat gold should be done taking into consideration the type of jewelry that the person needs. One should take into consideration, the amount of wear and tear the piece will likely endure. 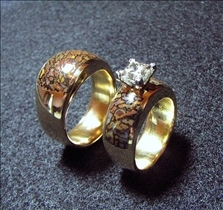 14k or 22k gold are both beautiful and can be found in many design applications in the jewelry industry. However, if a person keeps in mind its later appreciation value, the closest to pure gold a piece is, the better. When buying jewelry for investment purposes, 22k gold will appreciate more than 14k. Which gold would you rather wear every day?